I like this dessert because it’s light, creamy, and perfectly refreshing in warmer weather. Using skim milk ricotta cuts way back on the calories and allows you to indulge in the mascarpone. I used balsamic glaze as the topping when I made these last week which adds a tangy taste and great color variation. If you have a thick, flavored balsamic at home instead, I would match the fruit topping to the balsamic. For example: raspberry balsamic paired with raspberries and peaches, or fig balsamic with figs and sliced pears. I prefer to serve this dessert in mini sundae cups or martini glasses so that you can see the layers of fruit on the white cheese. It makes for a beautiful presentation. Use a hand mixer to whip the ricotta, mascarpone, and vanilla extract. Whip for 2-3 minutes, or until the cheese is light and fluffy. Mix the strawberries and peaches together in a small bowl. Put a large spoonful of fruit mix into the bottom of each of the four glasses. Use an ice cream scoop to divide the cheese mixture among the four glasses. Each serving size is 1/3 cup of cheese mixture. Top the glasses with the remaining fruit. Drizzle with balsamic glaze or vinegar in the same way you would chocolate on an ice cream sundae. ** To prepare ahead of time, whip the cheese mixture and mix the fruit in separate bowls. Layer the bottom fruit and cheese mixture into each of the glasses and refrigerate up to 3 hours. 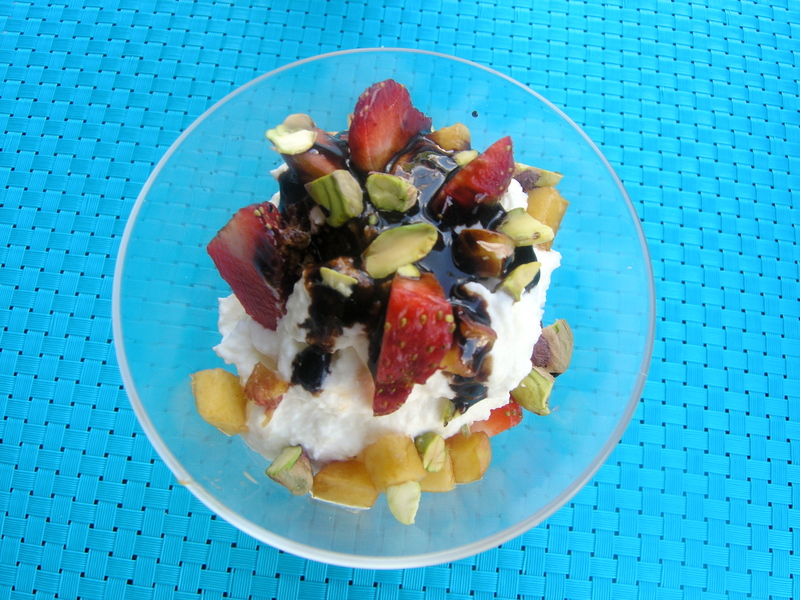 Top with the remaining fruit, balsamic, and pistachios when you are ready to serve.